(click on the thumbnail to see the mast-posts sticking up through the sand). 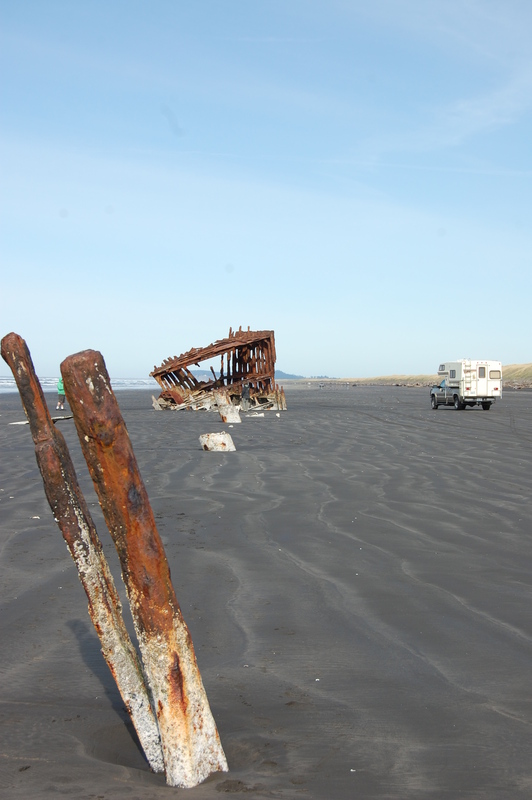 Drive out on the beach and park next to wreck … you can see the size of this old sailing vessel. Then, either go north for awhile (on the beach), or drive down to the last beach exit (almost 20 miles, close to Seaside). For us though, work calls … but we can take a few breaks and soak up some sun. A fitting lunch is clam chowder, a little brie and rice crackers! Thank You Lord for our mobile office. If you do this, watch the tide tables. On the beach the MiFi connection is strong, the view is inspiring, the food is good and the work must be done. Fishing boats come in close to give you a view of them at work … distracting if there are schedules to meet!